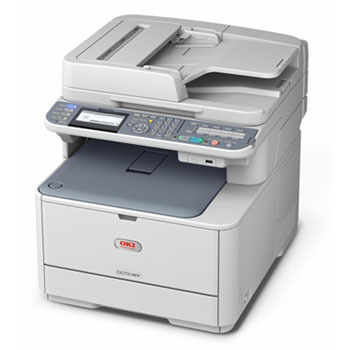 Looking for Oki CX2731 MFP Series Parts? The CX2731 Color MFP from OKI Printing Solutions combines high-quality color and four-in-one functionality with speed, reliability and ease of use- superior value from a desktop device that has a footprint small enough to fit easily into your environment. It's the perfect solution for the small- to medium-size workgroups in your company. Enhance the productivity of your staff- The CX2731 Color MFP is fast: it prints or copies up to 27 color pages or 31 black & white pages per minute, with the first color page printing in just 8 seconds1. It delivers color duplex prints or copies at the rate of 14 ppm, black & white at 16 ppm. Its reversing automatic document feeder (RADF) quickly scans both sides of a document, and its multi-tasking capabilities let you set up or perform two tasks at the same time. Scan at the machine or from your desk- With the CX2731 Color MFP, you can turn hard-copy documents into electronic files by placing them in the RADF or directly onto the flatbed scanner, scan them in black & white or color, and send the scan to a locally attached PC, to the shared directory on the network (without the need for additional software), to an e-mail address or to an FTP site. The CX2731 MFP prints and copies in HD Color, an OKI exclusive: multi-level printheads and microfine toner provide more detail, greater color depth and reduced grain, for breathtaking output even on ordinary office paper. It can make your job easier- The CX2731 Color MFP is really user friendly. It's network-ready right out of the box and has an intuitive operator panel that's simple to use, with a 3.5"" backlit LCD display that tilts up for easy reading, 1-touch keys for fast dialing, and a full QWERTY keyboard. It's also a full-featured fax- The CX2731 Color MFP has dual access functionality that lets you scan faxes into memory while the unit is busy sending or receiving faxes. It comes with a number of features found in more expensive units, such as T.37 Internet faxing, Tel/Fax auto switching, distinctive ring to differentiate between incoming fax messages and phone calls, a telephone answering device (TAD) interface, speed-dial ID display, and generous fax memory. Convert hard copies to digital files, manage your document workflow, and help the environment. The CX2731 Color MFP lets you do it all. OmniPage from Nuance-optical character recognition (OCR) software- quickly turns hard-copy office documents and forms into electronic files for easy editing, searching and sharing. Document management made simple- The CX2731 Color MFP includes ActKey software that lets you move between scan-to tasks- including Scan-to-Folder, Scan-to-Application and Scan-to-PC Fax- with a single click. Automatic ECO ModeWhen you're only printing a few pages, the CX2731 Color MFP's response is to enter this energy-saving, performance-enhancing setting. Same terrific output, lower power consumption. Everybody wins. Deep Sleep Mode The CX2731 Color MFP takes power-saving even more seriously when left on for an extended period: it slips into a -deep sleep- that expends just over a single watt to maintain. Mono Resource-Print Mode Even when the color toner runs out, you can still print needed documents in crisp, clear black & white. Simply cancel the original job and select this energy-efficient mode in the printer driver. One-piece image drum This long-lasting, user-replaceable consumable remains friendly to your budget while lowering the number of items to dispose of and store. Energy Star compliance With its lower power consumption- especially in Deep Sleep Mode- and standard duplexing, the CX2731 Color MFP meets the government's standards for energy efficiency.